← Our parts catalogue just keep growing. It has been over a year since I first embarked on reproducing the Alfa Romeo 750 series Veloce models toolkit. The new 750 series Veloce model Toolkit is completed and will available only offered exclusively by Auto Italia Sportiva, LLC. Some of these have already been presold and I will have a limited number available for sale. 10mm/16mm Spanner; 19mm open wrench; and the 8mm/10mm tube wrench. How much? I have bought two wiring harnesses and very hey with them! The 750 Veloce toolkits are $1,500. They are really nce and you will be happy with it. What is the black finish on the wrenches, and what metal are they cast in? The wrenches, and hammer are red brass and the black application is zinc plated black. The tommy bar, lug nut wrench, spark plug tube, carburetor tool, and hubcap tool are made of tool grade steel. The pliers and screwdrivers are sourced from a tool supplier. Hope that helps. 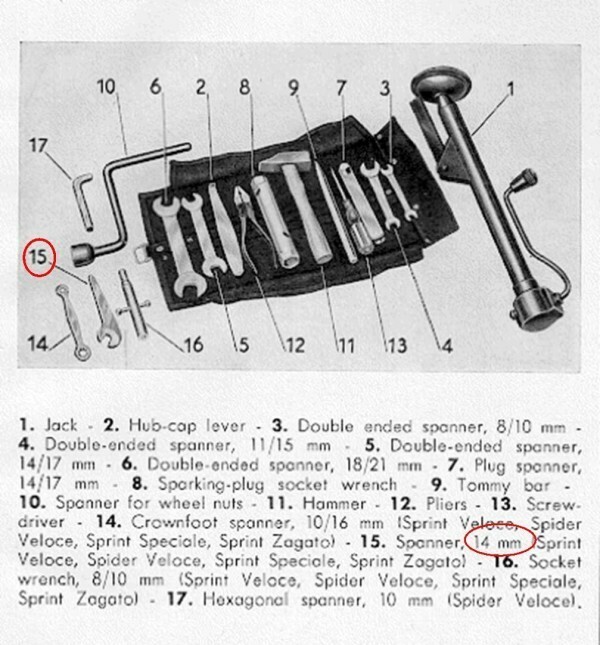 Are the tool kits for a 1959 Sprint different than Veloce? Do you have those? There are two types of toolkits available for Veloce models. 750 Series Veloce model or all vehicles originally fitted with the dual Weber 40dco3 were provided with the Black tool set which also contain the additional three tools for such early carburetors. Some late model transitional vehicles and 101 Series vehicles were fitted with the revised version of the 40dcoe2. Toolkits for these later models as well as the Normale used the same toolkit. Hope the above reference will assist you choose based on the current carburetor set up on your car. Yes, I do currently have a available both sets. Nice article by Alejandro! I am currently working on another small run consisting of ten sets which will include the Allen wrench. Five sets have been pre-sold already.